I have reviewed quite a few programs to download photos from Flickr in the past. From Flickr Download and Flickr Downloadr to Flickr Mass Downloader and the more recent Flickr Mass Downloader. All tools have in common that they can be used to download public photos that are hosted on Flickr. They differ in handling and features though. Update: Flickr Photo Downloader has been abandoned by its author. You can try one of the alternatives mentioned above or Bulk Image Downloader which is in active development. The latest addition is Flickr Photo Downloader, a lightweight easy to use Java application. Everything is configured in the main application interface. Here you can enter the Flickr user account name that you want photos downloaded from. The download directory is automatically adjusted by the downloader. That's handy for users who do not want to configure the download location manually, but it is possible for users who want to change it manually to another location on the computer. The remaining settings are for the photo size, which can be small, medium or large, and the number of pages that should be downloaded by the software. A click on the download button initiates the process. The download speed depends on the network bandwidth. One issue here is that the program is not displaying a progress bar or indicator. That's usually not a problem for smaller sized downloads but could be problematic for larger downloads as it is not clear when the downloads will finish. You could look into the download directory to see if there is progress, but that is the only way. Flickr Photo Downloader displays a message at the end that all photo downloads have been completed. 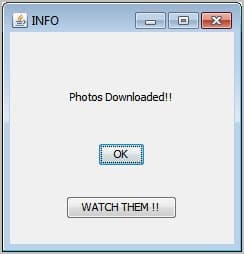 The program saves the photos by default into the user directory. 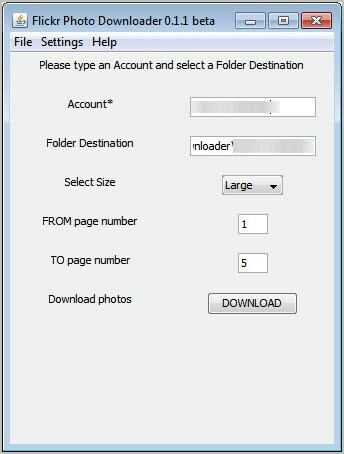 The dialog has an option to open the folder containing the newly downloaded photos directly. Users who have to use a proxy to connect to the Internet can configure one under the Settings menu link. The program seems to block downloads if the page count goes out of bounds. Flickr Photo Downloader is a small handy software to download photos from Flickr. It is compatible with 32-bit and 64-bit editions of the Windows operating system and available at the project's Google Code homepage.